Valerius Licinianus Licinius was born in Upper Moesia sometime during the middle of the 3rd century AD. Licinus began with a career in the military which eventually proved to be quite fruitful. He served under the Emperor Galerius rising to the position of a trusted lieutenant and even became a friend of the emperor himself. Licinus also assissted in the tetrarchy during 297 AD. During the Persian War, Licinus served valiantly and then later, on the Danube frontier, he finally achieved the rank of general. Licinius’ distinguished career broght him to the position of notice and as such he was chosen to stand in line as a successor to the tetrarchy itself. However, when Maxentius revolted and took the throne in Italy in 306 AD, the entire tetrarchy system designed by Diocletian was in danger of collapsing. In 308 AD, a metting was held among the competing leaders. At this Conference of Carnuntum, Galeriusused his senior influence to appoint Licinius to the post of Augustus, giving him control over the Danube and Illyricum regions in addition to most of the West. Despite his new gain power, Licinius’ position was far from strong. In 311 AD, Galerius died leaving Licinius in a difficult position to say the least. The first challenge to his power came from Egypt and Syria, when the Maximinus II Daia, began to make his move. In 312, Maximinus II attempted an invasion of the West by moving to take all of Thrace. Licinius had little choice but to face his opponent. 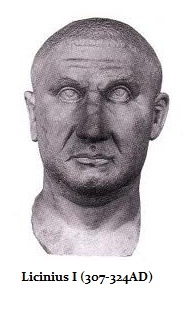 Licinius defeated Maximinus II, who was forced to retreat back to Asia Minor where he later died at Tarsus in 313. Licinius’ troubles were not over. A challenge in the West now came from Constantine I who succeeded in defeating Maxentius in 312AD, who also died in the battle. The Roman Empire was now divided between only two men Licinius and Constantine I as the tetrachy collapsed. Constantine I and Licinus, neither being in an extremely strong position where either was certain of victory over the other, came to a compromise. A political union was formed in 310 AD thus merging their two families. Licinius married Constantine’s sister, Constantia. Nonetheless, Constantine’s ambitions were not satisfied – he wanted sole power. In 314 AD, the first sign that the situation would not last. Debate over maintaining the tetrarchy revealed the strain between these two men. Trouble emerged when it came time to select their successors to the throne. Constantine I perhaps looked for a reason to wage war against Licinius and two years later he found it. War erupted and Constantine I was eager to take control. He marched against Licinius defeating his rival in two major encounters. Nonetheless, the battles were not the sweeping victory Constantine I had hope and the end result was an agreement that saw Licinius lose his Danubian and Illyrian provinces while retaining only the East. This treaty was sealed by the elevation of Constantine’s two sons, Crispus and Constantine II, to the rank of Caesar. In turn, Licinius’ son, Licinius II, was also raised to the rank of Caesar. The agreement between Constantine I and Licinius was to prove to be only temporary. Constantine I was still determined to establish his own dynasty. Constantine I used the Christians within the Empire as his power base and it was over this issue, where Christians would be given favored status, that a heated disputed emerged. This was the final excuse Constantine was waiting for – the moment where he could make his move to supreme power. In 322 AD, Constantine I was engaged against the Goths. As the barbarians fled into into Licinius’ territory, Constantine I used the excuse to invade. It was not the Goths who he wanted to defeat – it was now Licinius. War erupted once again and on July 3rd, 324 AD, the armies of Licinius and Constantine clashed in battle. Constantine I emerged triumphant at Adrianople and shortly thereafter a second battle was fought at sea off the coast of Chrysolopis. Licinius’ valiant effort to hold on to his rightful position were ended in that final battle with his defeat. Only through the intercession of Constantia, his wife and Constantine’s sister, was the life of Licinus and his son spared. If there is one thing that history has recorded, it is that despite Constantine I’s exaulted status as saviour of Christians, he was not a man of his word. Constantine I used the Christians as a power base only taking baptisim when he was near death. In the case of Licinius, Constantine I’s promise to spare their lives was also not kept. Before 325 AD had even ended, Constantine I had Licinius put him to death. Licinius II was executed in 327 AD. It must be stated as a matter of fact, that Licinius had actually supported Constantine I’s “Edict of Milan”, which granted Christianity its political freedom. Licinius had always honored that Edict until Constantine I became clearly hostile to Licinius. Still, this must be balanced by the fact that Licinius’ mistreatment of Diocletian’s widow, Prisca, has earned him a reputation in history as being ruthless and cruel.